Texas Legends shooting guard P.J. Hariston's profile offers a fairly unique glimpse into the style of play in the NBADL on paper as well as how quickly he adapted and thrived playing in it. The 2nd highest volume offensive player in this group averaging 19.7 possessions per-game, Hairston also ranks as the 3rd most efficient scorer in this group averaging 1.108 points per possession overall. He turned the ball over just 9% of the time in a catch and shoot heavy role, the lowest rate of any player in this group. The former UNC standout did a significant amount of his damage in transition with a 2nd ranked 27.9% of his possessions coming on the break where he scored a 2nd ranked 1.27 points per possession. In the half court, the majority of Hairston's possessions came in spot up situations, as he used a sample high 5.4 spot-up possessions per-game. With just 6.3% of his possessions coming on the pick and roll and 6.9% coming in isolation situations, both of which rank in the bottom-3 among players in this group, Hairston exploited the pace and spacing of the D-League to rank among its top scorers. Almost half of Hairston's possessions were catch and shoot jump shot, more than any player in this group. Though he made just 34.3% of those attempts, he made 47.6% of his pull-up jump shots on limited attempts, ranking above average in perimeter scoring efficiency overall. Ranking just average as a finisher, Hairston's huge role and at times explosive shooting in the NBADL gives teams a very accurate gauge of what he'll bring to the table as a rookie. P.J. Hairston was forced to play out this season in the D-League with the Texas Legends after being dismissed by North Carolina in December. He put up monstrous scoring numbers, but still has many question marks around him. Now that he's officially in the Draft as an automatically eligible player, we can take a step back and conduct an inventory of everything he displayed this season as an NBA prospect, as well as the things he still has to improve on. 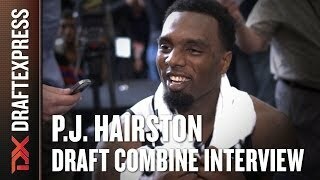 Hairston is one of the few prospects in this draft who looks ready to come in and play a role in the NBA right away. His thick, strong build (230 pounds) is a major reason why he was able to adjust to the D-League so quickly, averaging 27 points per-40 minutes, as his shooting ability and aggressive style of play are tailor made for the NBA. Hairston's jump-shot is clearly his most translatable NBA skill. He made 73 3-pointers in 26 D-League games, not needing any time to adjust to the much further distance of the NBA 3-point line thanks to his terrific shooting mechanics and range. Hairston has a pure and beautiful stroke, with great balance and follow through, and consistent elevation which he uses effectively to create separation and get his shot off quickly in a multitude of ways. While he was a little bit streaky with his feet set this season (made 34% of his attempts), his ability to come off screens, shoot off dribble hand-offs, and hit pull-ups from all over the floor. He's terrific in quick actions, being especially effective in transition and early-offense situations, which makes him a very valuable weapon in the increasingly up-tempo nature of the NBA. Just to complete the picture about the type of shooter he is, he made 87% of his free throw attempts this season, fourth best among all players in our Top-100 prospect rankings. Hairston's thick build and aggressive nature allows him to be somewhat of a threat to attack opponents off the dribble, mostly on closeouts and early-offense situations. He's difficult to stop when he can get a step on his defender and make his way to the basket in a straight-line, as he's strong enough to simply bully his way to the rim and take contact inside the paint to finish plays off. He generated 6.9 free throw attempts per-40 minutes this season, a very solid mark, and converts those effectively as already noted. Spending most of his time guarding small forwards, like he did at North Carolina, Hairston showed very nice potential defensively this season, particularly early on when he was locked in and really focused on getting stops (something that definitely wavered as the year moved on and the reality of the D-League set in). His excellent wingspan (6-9 ½) and strong frame allows him to play bigger than his just-average height, and he does a very good job of getting over ball-screens thanks to his quick feet and ability to fight through picks. His length and solid instincts serve him well in the passing lanes (1.9 steals per-40, just like at North Carolina) and he'll also come up with the occasional blocked shot for good measure. If Hairston puts his mind to it, he should be able to emerge as a solid defender at both wing spots in the NBA. Unfortunately, Hairston developed some bad habits as the season moved on, as his effort level really tapered off towards the end of the year. He looked to be playing at half-speed on many possessions defensively, which is partially a product of the D-League's style of play and culture, but also something that was an issue for him earlier in his career, as there have been some concerns in the past about his weight and work ethic. Hairston looked so focused on leaking out offensively that his rebounding numbers fell dramatically from his sophomore campaign at UNC (7.4 per-40 then, 4.3 this year). Hairston also ranked as one of the worst passers in the D-League this season, generating an assist on just 4.1% of his possessions (21 total assists in 839 minutes), one of the lowest rates among all players in our Top-100 prospect rankings. While some of this has to do with the nature of his role on the Texas Legends (essentially a hired gun) and some of it is a product of the style of play of the D-League in general, his assist rate ranks very poorly even compared to other D-League wing players, dead last among NBADL shooting guards in fact. Hairston is not someone a team can really run a lot of offense through, as he's at his best playing off the ball. Isolation and pick and roll plays made up just 13% of his offense this season, similar to last year at UNC (15.8%), as he simply is not a great ball-handler or decision maker. Hairston possesses just an average first step, and doesn't show great change of speed or direction ability to compensate for that. Nearly 70% of his half-court attempts came on jump-shots, and he struggles somewhat trying to finish inside the painthe hit just 50% of his these attempts (around the basket plus runners/floaters) in the half-court this season, after converting 51% of them in college last year. Hairston won't ever be described as a freakish athlete, particularly in terms of his pure leaping ability, even if he can throw down some impressive dunks in transition at times thanks to his long wingspan. NBA teams will certainly want to do more research about Hairston's dismissal from UNC, as well as his overall character. Barring any significant red flags, though, all in all it seems very easy to find a role and niche for Hairston in the NBA, particularly if he's willing to put the effort in defensively. We've taken a more visual look at his strengths and weaknesses thanks to game film from the D-League in the following video scouting report, courtesy of Mike Schmitz. Note: This interview was conducted after Monday's game against the L.A. D-Fenders. DX: Before I get to the Carolina stuff, let's start with how you wound up in the D-League. PJH: I had the opportunity to take online courses at UNC. And I wanted to stay here so that I could still be on pace to get my degree next spring. DX: Did you get advice on the D-League from any players? DX: What has been your first impression of the D-League? PJH: My first impression was that it was better competition, and the pace of the game was much faster than it is in college. DX: What was your mindset coming here? PJH: I came in just like a normal other player would. I came in and tried to do the little things  like play defense and just put the ball in the rim. I didn't expect to come here and average 40, 50 points a game, I expected to come here and be able to work on my game and become a better player. DX: How do you look back on your time at North Carolina? PJH: Good memories mostly, I don't really regret anything at school. DX: Do you still watch your old team? PJH: I still watch them and I still talk to my teammates a lot. I try to text them after every game and if not, I'll send them a text message during the week. DX: Do you feel that you were treated fairly by the school? DX: What would you tell NBA teams about your dismissal? PJH: The past is the past. I made some mistakes and of course I regret them fully. I just know they will never happen again because I would never put myself in that situation again. DX: What would you like to tell people as your side of the story? PJH: Actions speak louder than words so I don't really want to say anything. Anyone can say, I'm going to be a better person, but you have to show it. Like now, I'm a professional athlete. I have to show professionalism. It's a grown man business and I know that I have to make decisions on my own now. It's not college, no one's going to be there to babysit me. It's part of the maturing stage for me and I want to show that I'm a way better person than what was assumed. DX: How will the D-League prepare you for the NBA Draft? PJH: There are scouts at every game. My goal is to show them what I've worked on and show what I've done to become a better player. Also, how I'm getting used to the pace of the game, how I can stay in shape and just the different things I've worked on along my journey. DX: You are currently number 25 on our mock draft. Do you think that is realistic? PJH: I don't really pay attention to the mock drafts. I just try to play hard each and every night and work on my game to be better. If I jumped up twenty spots to number five, I'd be excited, but there are still four other people who have worked harder than me. Mike Schmitz is the video analyst for DraftExpress. Follow him on twitter and subscribe to the DraftExpress YouTube page. He will be breaking down the NBA draft in digital format all year long for us. P.J. Hairston was the fourth finalist of the group. P.J. Hairston tosses the rock to himself from behind the arc and then catches it and one-hand windmills it home for the slam. P.J. Hairston grabs the ball off of the bounce and then clutches before reverse dunking. P.J. Hairston shoots it from behind the 3-point line and then catches it one-handed off the bounce before doing a 360 dunk. A 6-5 shooting guard committed to North Carolina, P.J. Hairston (#18 Scout, #14 Rivals, #13 ESPN) did little this weekend to dispel the notion that he's a McDonald's All-American caliber prospect. Sporting a thick, college-ready frame that he's apparently gotten into the best shape of his short career as of late, Hairston is a stocky shooting guard with an average wingspan, and good but not great athleticism. While not terribly quick, Hairston has terrific strength and solid leaping ability, as well as the mentality needed to take advantage of his tools. Offensively, Hairston's main virtue as a prospect revolves around his phenomenal perimeter shooting ability. He has picture-perfect shooting mechanics, including a quick release, deep range, excellent arc and a beautiful follow through, being capable of knocking down shots all the way out to the NBA 3-point, as he showed regularly this past weekend. He has unlimited confidence in his shot-making ability, particularly in catch and shoot situations, where he's near-automatic with his feet set. As a shot-creator, Hairston is just average at this point, as he's not a particularly creative ball-handler and loses effectiveness when forced to shoot off the dribble. He's able to overpower defenders at this level and get to the basket with straight-line drives, using his strength to finish well around the rim, especially driving left. To reach his full potential as a scorer, Hairston would be well served improving his advanced ball-handling skills, though, especially his ability to play at different speeds and change directions with the ball. Hairston also contributes to his team with his high basketball IQ, looking both willing and able to make the extra pass and find the open man. He also puts a good effort in both defensively and on the glass, more than holding his own in this area this weekend. He moves off the ball intelligently and seems to have all the attributes needed to play within a system, as he's a serious, competitive player who seems to know his limitations and puts a good effort in on most possessions. Hairston's long-term upside might not be as high as some of the other McDonald's All-American wing players in this class, but there's no question that he has an excellent college career ahead of him. We'll need to see how he makes the transition to the NCAA level to further asses his pro prospects.